There are probably dozens of reasons pop fans will head out to see New Kids on the Block, 98 Degrees and Boyz II Men on the Package Tour this summer. We'll spare you our reasons, but headliners NKOTB shared a few of their own when MTV News hit the L.A. set of their "Remix (I Like The)" video. "Boyz II Men have not done an arena tour," Donnie Wahlberg said before breaking down all the other reasons this tour is sure to please. "98 Degrees is doing their first show together in 12 years, so it's a big deal. We're doing our first tour with just us [without Backstreet Boys] in three years, so we are going to put on our show, and they are going to put on theirs." If having three A-list boy bands on the same bill isn't enough, Joey McIntyre teased that an onstage collaboration or two just might be in the works. "New Kids are going to perform on their own, Boyz II Men on their own, 98 Degrees on their own, so all the fans can see their groups do their thing separately," he said. "Within that, you know, I would be surprised if we didn't kind of have some surprises and get together, 'cause it would be a lot of fun." 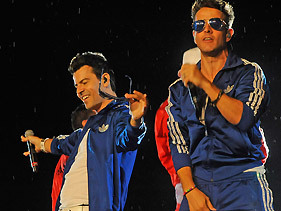 They are still working it out before the tour kicks off May 31 in Uncasville, Connecticut. "Like Joe said, once we get all those shows situated, I'm sure were gonna have a little fun ... trickery, skullduggery!" Donnie Wahlberg chimed in. The tour wraps up July 13 in Minneapolis, but not before the boy bands make stops all around North America. Each night, BIIM will kick off the concert, followed by 98 Degrees and then NKOTB. It's a busy time for the Beantown fivesome. Not only are the New Kids prepping for their summer tour, but also the release of their next album,10, out April 2.